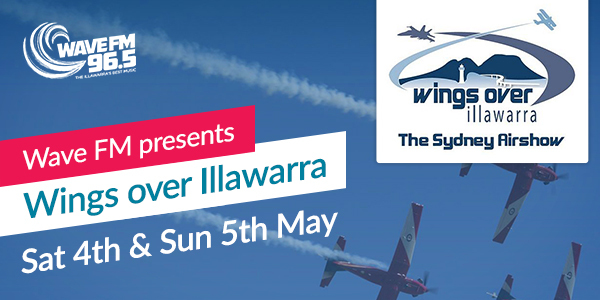 Wave FM presents one of Australia's best airshows, Wings Over Illawarra 2018! Set to hit Albion Park Regional Airport from Saturday May 4th - Sunday May 6th, Wings is sure to be an aviation extravaganza! This year's show will include the best aerial acrobatic displays, alongside a spectacular array of classic warbirds and vintage warcrafts. For your chance to score a free family pass, simply register your details below. There will be designated parking areas at the airport for Gold Pass holders only during the airshow. Offsite parking will be available for General Admission patrons a short distance away from the airport. A FREE shuttle bus service will operate to and from the main entrance gate throughout each day of the airshow. This parking area will have a FREE shuttle bus service to and from the main airshow gates all day and will be manned by volunteers from the NSW Rural Fire Service and other local community groups for the duration of the show to help ensure the safety of vehicles. A parking fee of $5 per vehicle will be charged with all proceeds going to local community groups. There will be access to Wings Over Illawarra via the Illawarra Light Rail Museum for those wishing to enjoy a vintage train ride to and from the airshow. The cost of a return train ride will be $5.00 per adult and $2.00 per child. The Illawarra Light Rail Museum and train rides will be available from 9am to 5pm on Saturday and Sunday and the entrance is located on Croome Rd. To ensure you don't miss out, we encourage you to purchase your tickets online and prior to the day. For ticket sales and further information, click here. No alcoholic beverages are to be brought onsite. ATMs will be available at the event. Locations will be marked on the site map and in the program available on the day. Cameras and videos are encouraged. A first aid facility will be located at the event and its location will be marked on the site map and in the program available on the day. A variety of food stalls will be available throughout the event site. Limited seating will be provided for general admission attendees to view the airshow. Visitors are permitted and encouraged to bring chairs with them. Official Wings Over Illawarra merchandise will be available at the event. Pets are not permitted on the event site. NO refunds will be available unless the event is cancelled. Scooters , Bikes & Skateboards are not permitted at the event. Smoking is not permitted anywhere within the bounds of the airshow area. RAAF F/A-18 Hornet with "Wall of Fire"